Numbers in this visual are relative to the individual descriptions of each dog's test. Yardage provided by Marshal Chair. Test 7 is a land quad with two retired. The test is situated in a long valley with the mat on the northwest rim and the four marks are down the eastern side of the valley. 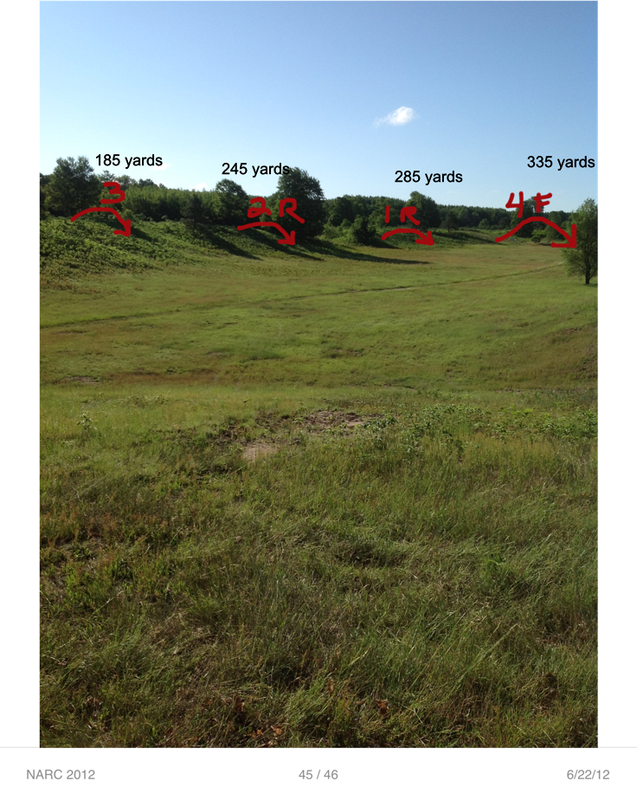 Bird #1 is slightly in front of the mat on the top of the opposite ridge, throwing flat, left to right at 126 yards. This set of guns are in heavy cover and do not retire, but when they sit down, only their heads show. Bird #2 is farther down the valley, approximately the same distance at the top of the ridge as bird one also throwing left to right at 174 yards and they retire behind a tree. Bird #3 is farther down the valley, the bird is thrown left to right and they retire into a clump of trees at 260 yards. 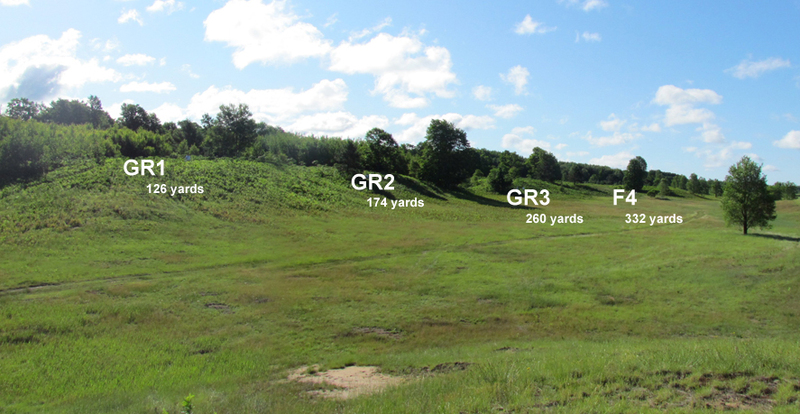 The fourth set of guns is the flyer station at the opposite end of the valley from the mat at 332 yards. They also shoot from left to right. The order for the test is bird 3, 2, 1, and then the flyer. The test is taking about 10-12 minutes per dog. The test has been altered many times, distances will be provided when available. Test dog MS Micro Doodle Dandy, LM, Tom Bogusky, came to the line at 8:03 a.m. She picked the birds up: flyer, bird 2, bird 1, and then bird 3. She had a handle on bird 3. She fell in a rough spot in the valley which was quickly addressed by the grounds committee as soon as the dog completed her run. Test dog FC Ranger's Black Bart, LM, Marsha McGee, came to the line at 8:31 a.m. He had a fall going for the flyer first, and had to be handle. He then picked up bird 1, bird 2 and bird 3 clean...in that order. The grounds committee went back out with a shovel and four-wheelers checking for any further dips. Once it was deemed safe, our first running dog, #52, came to the line at 8:38 a.m.